T-Mobile announced on Monday morning that it will offer the LG Optimus L9 later this fall. The Optimus L9 is equipped with a 4.5-inch display with a qHD resolution, support for T-Mobile’s HSPA+ network, a 5-megapixel camera capable of recording 1080p video, a 2,150mAh battery, a 1GHz dual-core processor, support for placing calls over Wi-Fi networks, Bluetooth 3.0 and a frame that’s just 0.36-inches thick. Unfortunately, the Optimus L9 will launch with Android 4.0 Ice Cream Sandwich installed, and T-Mobile didn’t say whether or not it will update the phone to the newer Android 4.1 Jelly Bean operating system. The device is set to launch before the holidays, and we hope it comes in around the $99 price point. Otherwise, you’re probably better off with the much more powerful Samsung Galaxy S III or even the beautiful and slim HTC One S.
Long-Lasting Battery for Extended Connectivity and Delivers Superior 4G Experiences and Value with the Power of T-Mobile’s Nationwide Network. ENGLEWOOD CLIFFS, N.J., Oct. 8, 2012 — LG Electronics USA and T-Mobile USA, Inc., today announced that the stylish and powerful LG Optimus L9 smartphone will be available this fall. LG Optimus L9 features Android 4.0 Ice Cream Sandwich and a gorgeous 4.5-inch qHD Corning® Gorilla® Glass 2 display for bright colors and clear text. LG Optimus L9 is equipped with a long-lasting 2,150 mAh battery so users can watch video, listen to music, explore the Internet or chat with friends and family for hours with just one charge. LG Optimus L9 also features LG QuickMemo™, a smartphone experience with powerful note-taking capabilities that lets users add commentary, notes and drawings to screenshots with a few swipes of a finger, then share them with friends and family via social media and email. LG Optimus L9 provides users with a five-megapixel camera and true-to-life 1080p HD video recording capability, so all of life’s important moments can be captured with clarity. For spontaneous photo-worthy events, the LG Optimus L9 lets users snap photos while simultaneously capturing video and take advantage of voice-activated photos using “Cheese Shot” by simply saying “cheese” to snap a picture. 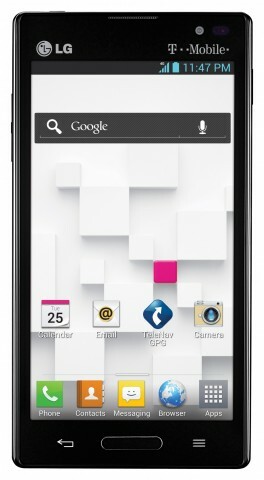 LG Optimus L9 features a suite of connectivity technology. Whether it’s streaming high definition movies over T-Mobile’s 4G network, sharing a data connection with up to five devices using LG Optimus L9 as a Portable Wi-Fi® Hotspot via T-Mobile’s Smartphone Mobile HotSpot feature with a qualifying rate plan, or making calls over a Wi-Fi network with T-Mobile’s Wi-Fi Calling feature, LG Optimus L9 has the wireless capabilities to keep users connected virtually wherever they are. Slacker and Slacker.com are registered trademarks of Slacker, Inc. All other registered or unregistered trademarks are the sole property of their respective owners.